I'm not a lawyer, but I've spent much time with one. This page gives you useful information that we've learned from a decade of litigating copyright infringement suits. In our cases, I was the plaintiff, and it was my before and after photos that were infringed. Of course, you need your own attorney. Don't even think of holding us responsible for errors you make because you used the information here, whether the information is correct or not! Here is a link to the Oct 28, 2013 Fortune magazine article that discusses these lawsuits. Things you should know and do BEFORE your work is infringed. I present this information from the standpoint of a surgeon protecting his before and after photos, but it's certainly applicable to anyone protecting images, online or otherwise, and non-image intellectual property as well. All of your work is already copyrighted. As soon as you take a photograph, you own it; it's copyrighted. What you haven't done yet is to register the copyright with the U.S. Copyright Office. You register the copyright on your photos simply by filling out a form and attaching copies of the photographs. If someone uses your photographs without permission, and you want to sue them for damages or just to get them to stop, you must sue in Federal Court, and to do that, you must first register the copyright on your photographs. Actual damages can be difficult to prove. 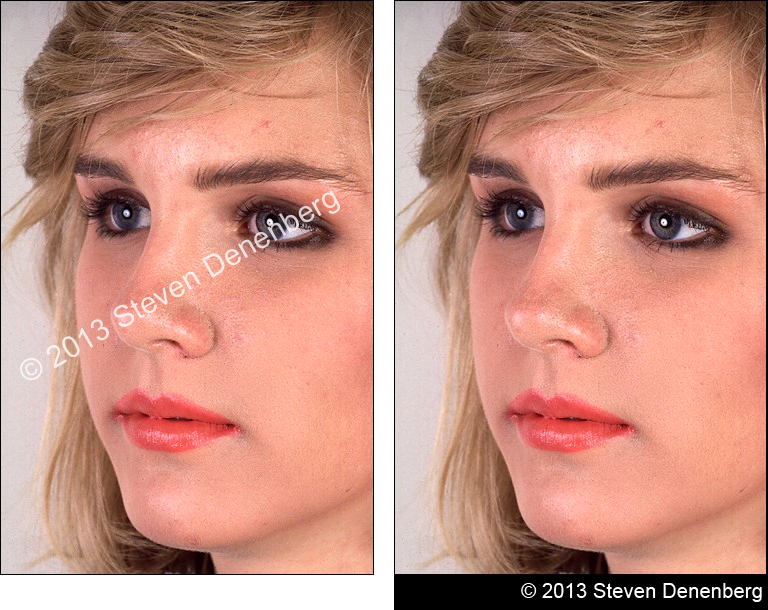 For example, in the case of another plastic surgeon using my photos, how do I prove any actual loss of income? Since actual damages, depending on the case, can be so difficult to prove, copyright law allows the Court to grant "special" damages, which are not tied to any "actual" loss of your revenue or profit made by the infringers. Special damages are up to $150,000 for each infringement if the infringement was "willful," and up to $30,000 for each infringement if the infringement was not willful. The law also specifically allows you to recover your attorney's fees. You will discuss with your attorney how you might prove that the infringement of your photos was "willful." Now here's the catch: in order to be eligible for special damages and attorney's fees, you must register your photographs before the infringement begins. If you discover an infringement before you register your photos, you can still sue (after you register the photos), but you cannot recover special damages or attorney's fees. The most you can get is an injunction against the infringer continuing to use the photos, and of course any actual damages, if you can prove them. The solution: register your photos now. It's easy, it's cheap, and it provides huge protection. Copyright law also gives you a grace period for registering your photos. If you register the photos within three months of their first publication (first putting them up on your Web site), then you are eligible for special damages and attorney's fees, even if the infringement begins before you register the photos. Example A: You discover an infringement of your photos. Your investigation shows that the infringement began back in January of 2010. But you had registered your copyright on those photos back in 2008. You're protected. You can get special damages and attorney's fees. Example B: You mount your photos on January 1, 2014. An infringement begins on February 1, 2014. You haven't registered your photos yet. But as long as you register before April 1, 2014, you are still entitled to special damages and attorney's fees. As long as you file your registration application forms by April 1, you are protected. Example C: This example is probably more common for those of us who are not in the habit of registering copyrights. You discover an infringement in January of 2013. You haven't registered the photos yet. But you first posted the photos back in 2009. Since three months after the first publication date has long passed, you cannot recover special damages or attorney's fees. You still must register your photos if you want to sue in Federal court, and all you can recover is an injunction and actual damages, if you can prove them. And you'll have to pay your attorney to do all of that. Solution: register your photos now. Or did I say that already? When you see an infringement, print out every page containing infringements, and download those pages to your computer. You need to keep a record, because the infringer will probably remove the infringing images as soon as you contact him. You cannot prevent people from taking your photos. If you see an image in your Web browser, you can take it. Easily. From my Web site. From yours. From the CIA's Web site. If you can see it, you can get it. Usually by right-clicking the image and choosing "Save as . . ." from the menu that appears. The award for a successful lawsuit is a certain amount "per infringement." That means that if the infringer took ten of your photos, there can be ten awards given by the Court. To minimize his losses, the infringer's attorney may try to claim that the copyright of your Web site is a "compilation." You "compiled" your photos together into a Web site, so he infringed on only one item, the compilation, and you are entitled to only one award, not ten. Well, his infringement is almost certainly not of a compilation (email me if you want the arguments along these lines that we prepared for the Court), but you can thwart that legal defense by "group registering" your images. I'll explain. A Web site is often registered using the U.S. Copyright Office's Form TX. That's how I originally registered my Web site, claiming ownership of all text, diagrams, and photographs. But that's not the best way to register a Web site if it's really the photographs, and not extensive creative text, that you want to protect. Better is to make a "group registration" of your photos by using Form GR/PPH/CON, and submitting the photos and a list describing each photo. Now it will be clear that you have individually copyrighted each photograph, and you are entitled to a separate damage award for each photograph infringed. The group registration form must be submitted with Form VA (visual arts) as well. An infringement can be "willful" or not "willful." If the infringement is not willful, it can be "innocent" or not "innocent." Copyright law says that the infringement of a photograph cannot be considered "innocent" if the copyright mark is affixed to the photograph, so do that if you can. I personally don't recommend that — it just degrades the value of the image on your publication. Rather, affix the copyright mark to the photo in a location where it won't get in the way of someone learning from or enjoying the photo, such as its location on the right photo. Those words are part of the image, not printed below the image. When someone saves these photos to his disk, he'll have the copyright mark, and the infringement cannot be "innocent." It's also possible that having the copyright mark on the same Web page as the photograph, close to the photograph, could make the infringement "not innocent," but if the mark is part of the photograph, there's no question. If the mark is not on the photograph, it does not mean that the infringement was innocent — it's just that having the mark on the photograph means that the infringement cannot be innocent. The copyright mark must be formatted correctly: the C-in-a-circle, or just the word "Copyright," and the year of first publication, and the owner of the copyright. First, find out whether your infringement began before the copyright was registered and more than three months after the images were first published. "Published" can mean "put up on a Web site." If so, then the copyright owner cannot get statutory damages or attorney's fees from you. Make sure your attorney informs the plaintiff of that fact; it can push him to settle early, for a smaller amount. If the copyright that you infringed on was registered in a timely fashion, settle the case right now. Don't let your attorney drag it on. Whether the infringement was willful or innocent, if there truly was an infringement, plaintiff will prevail, and whatever the damages, actual or statutory, you will have to pay plaintiff's attorney's fees. And think about this: whatever work you cause the plaintiff's attorney to do, your attorney will be doing the same work, and you'll have to pay him, too! Double trouble. For example, in several of my cases, the defendant started out with many months of trying to have the lawsuit moved from the U.S. District Court for the District of Nebraska to a Federal District Court closer to the defendant's home. But the defendant had to pay his lawyer for all that work, and my lawyer had to match all that work to try to keep the suit here in Nebraska. Eventually, defendant would have to pay both attorneys for the work of trying to move the case. And moving the case won't change the outcome. Save your money and settle. This may shock you, but the rare, rare attorney might launch into other shenanigans, too, such as extensive, unnecessary interrogatories, to prolong a case and bill more hours. Skip the double trouble. If you are sued for infringement, get a realistic assessment of whether you really did it. If you did, get the case settled! When you make an offer of settlement, have your attorney make it as a Rule #68 offer. Using that rule of the Federal Courts, if the plaintiff refuses your offer, and then wins his case, but is awarded less than your offer, the Court can require that the plaintiff pay many of your fees.